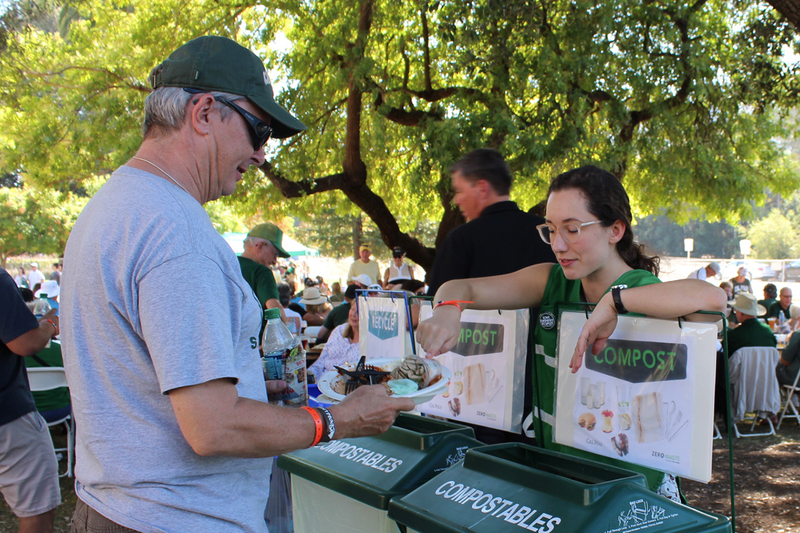 In 2017, Cal Poly inaugurated the Zero Waste Ambassadors program, where students volunteer at campus events to instruct event attendees on how to recycle and compost properly. The program successfully manages the consumer waste stream at select Cal Poly events by diverting 90 percent of waste from landfill through collaboration, education, outreach, and community service. The role of student Zero Waste Ambassadors is to separate waste produced at an event into appropriate compost, recycling, and landfill bins, while educating attendees on proper sorting to support Cal Poly’s recycling and composting initiatives. In 2017/18, with nearly 150 volunteers, the program reached more than 14,200 attendees at 25 events over seven months and diverted over 3 tons of waste from the landfill. Volunteers are essential in the success of the program and welcomes volunteers from student clubs, greek life, and students who have been assigned community service hours through Cal Poly’s Office of Students Rights and Responsibilities (OSRR).To volunteer as a Zero Waste Ambassador, contact cpzerowaste@calpoly.edu or complete this interest form.